Make the most of the coming year. As we count down the final hours of 2017 on this last day and final blog post of the year, let’s pause a moment and take stock of the past twelve months. It may not have been a perfect year for most of us, but when we reflect back, in most cases we’d have to agree that there were far more good times than bad. There will always be a small percentage of people we know who had a rough year. These people constantly exclaim ‘I can’t wait for this year to be over’. For me, the only real part that I dislike and am ready for to end is always winter. I’m not a fan of the snow and ice. I dislike the short days of early darkness and sub-freezing temperatures. In North America, winter spans the end of the old year, and the beginning of the new. Seasons change, and winter exists in part to make us appreciate spring, summer and autumn all the more. We have no control over the weather, just how we prepare for it. We carry an umbrella in case it rains. We have a coat or jacket in case it gets cold. Only a foolish person curses the weather because they chose not to plan accordingly. We don’t always have to like circumstances beyond our control, but realistically we know that the situation will change in time, and with proper planning and precautions, we can weather the storm. Make it your goal to accept the things you have no control over, and make positive changes over the things that you can control. Zip-a-dee-doo-dah, zip-a-dee-ay! My, oh my, what a wonderful day! Every day each and every one of us gets 86,400 seconds to spend however we choose, with just two exceptions. The day we’re born and the day we die. Excluding those, our days are all the same length, yet some people never seem to get anything done, while others accomplish an incredible amount. The difference was the result of the choices made, and the attitude behind them. Planning your day out ‘saves time’. Procrastinating wastes it. Being miserable makes the day drag, but time flies when you’re having fun. Did you dwell on the past instead of planning for the future? Keep a positive attitude and try to find one good thing to be thankful for each day. Then focus on that. A positive attitude will attract like-minded people and soon you’ll be surrounded by a positive support group to help keep you encouraged. Remember, no one likes a sad sack. Plan ahead, and plan early. Don’t put off for tomorrow what can be done today! Prior proper planning prevents poor performance . Manage your time, manage your expenses. Make positive changes in every aspect of your life, and multi-task when you have complimentary goals. The great thing about New Year’s is that it’s a reminder that we can start over. If you didn’t like the way this past year went, you can look back on what went wrong, and make changes to fix the problems. You can make New Year’s Resolutions for every item under the sun. The key though, is that you must complete the goal to achieve the result. If you change nothing, nothing will change. You can do it if you stay motivated. One key way to achieve this is by seeing positive change over a period of time. If you have a fitness goal, such as losing weight, break it down into smaller, easily achievable goals. Instead of focusing on the sixty pounds you want to lose this year, focus on the five pounds you need to lose in each of the twelve months and be consistent. Track your progress so that you can see how far you’ve come. And if you reach the goal early, go the extra mile and get ahead of the game. This way if you hit a plateau, or a stumbling block, you’ve got breathing room to regroup and recover from the setback. The same thing applies to financial goals. Slow and steady wins the race. Baby steps forward are still progress. I faced it all and I stood tall And did it my way! The Man in the Mirror is a book written by Patrick Morley in 1989. I recommend reading it, as well as exploring any self-help books pertaining to the area of your life that you wish to change. In The Man in the Mirror , the author attempts to teach us to solve 24 problems every man faces in life. Although geared for men, this book applies to everyone. The title is the clue to the cause of the problems, and the solution is to live our lives in a more godly manner. How many of the problems we face in our lives are a direct result of our stubbornness to do it ‘our way’ instead of the right way? How many times do we repeat the same mistakes and expect different results? An honest person is forced to admit that the larger portion of our misfortunes are self-made. Blaming the year and wishing it were over is a very childish way to deal with one’s problems. After all, if you don’t effect positive changes in your life, most likely next year will be a repeat of this year, or maybe be even worse. The choice is up to you! Are you ready for more of the same, or a fantastic new beginning? You decide. As always I wish you happiness and success! 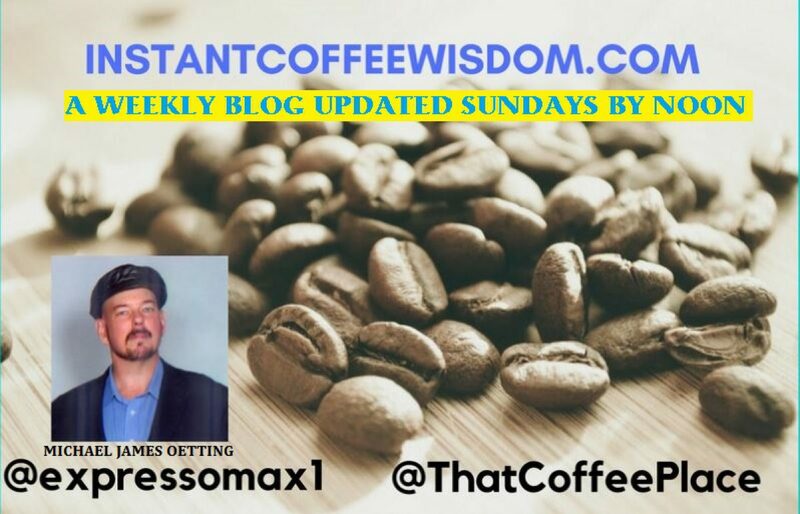 Author instantcoffeewisdomPosted on December 31, 2017 Tags debt, diet, finance, friends, God, happiness, Secret, self improvement, successLeave a comment on A new year, a new you! As I’m sitting here in the wee small hours of the morning of Christmas Eve 2017 working on my last Christmas-themed financial blog post of 2017, the main thought that is going through my mind is, ” I LOVE CHRISTMAS!” It is impossible ignore the fact that whatever your personal religious beliefs are, Christmas begins with CHRIST, Jesus is the reason for the season, and Christians like myself become ‘a little more vocal’ about what we believe. Christmas is a very good thing for both the believer and the non-believer alike. It truly is the most wonderful time of the year! So if you don’t believe in Christ, please don’t take offense at a person extending you a heartfelt ‘Merry Christmas’ at this time of year. It’s not a religious threat or insult, it’s a olive branch or a bridge to show that we are all connected. Take it in the spirit of goodwill in which it’s meant. Talking about ‘spirits’ and giving brings to mind two secular and fictional aspects of Christmas: Ebeneezer Scrooge and Santa Claus. There are people in this world today who claim that being wealthy is a sign of greed, and that somehow the rich people of the world are responsible for causing the poverty in it. This is far from the truth. Wealthy people pay the majority of all taxes collected, and donate the largest sums to charities. They build the factories, fund the businesses, and create the jobs. The protagonist of A Christmas Carol written by Charles Dickens is a miser named Ebeneezer Scrooge. Some people get the idea that he’s the villain of the tale because all he cares about is money. Scrooge isn’t the bad guy because he has money, but because he lives a joyless existence, he mistreats his employees, and he’s horded his wealth instead of using it to bless the needy and do acts of great good. After he’s visited by the Christmas spirits, he sees the error of his ways, and is transformed by the renewing of his heart and mind. He then does great acts of charity that would not have been possible had he been poor. There are some acts of generosity that only a wealthy person has the ability to do. Anyone can smile, say a kind word, do good deeds, or pray for other people. These things are good, and we should always do them. Most people can even afford to donate money to the less fortunate, even if it’s only coins in the Salvation Army Kettle at Christmastime. Only the rich can give charities million-dollar endowments or build factories to create jobs. Santa Claus is a bit more tricky. His origins have been mixed with fable thanks to L. Frank Baum and Clement C. Moore. Elves and reindeer aside, ‘Father Christmas’ is based on a real person, Saint Nicolas of Myra was a Christian bishop who helped the needy. He was born circa 280 AD and died December 6th 345 AD. In the twentieth century, Santa Claus stated to supplant Christ as the focus of Christmas, basically because he was a fun way to make the season more ‘inclusive’. Some people who were not religious felt left out. So advertising departments of companies like Coca-cola and Macy’s ran with Santa as a jolly alternative, and a new representative of Christmas goodwill. This is both good and bad. Bad because Santa distracts us from ‘the real reason for the season’ and can be confusing for young children. Good because Santa is FUN, and inspires giving. As a Christian, I KNOW that ALL things come from God, and everything I have ultimately came from The Lord of All Creation. Christians especially have a duty to use their God-given gifts in the service of God, and Christmas gives us many great opportunities to help the less fortunate. I find myself a little merrier wearing a red Santa hat, it inspires me! I’m going to wrap this up with the inspiring true story of Larry Stewart, the Secret Santa. Kind words and kind actions can change lives! Larry Stewart (April 1, 1948 – January 12, 2007) was an American philanthropist from Kansas City better known as “Kansas City’s Secret Santa.” After poor beginnings, Stewart — from 1979 through 2006 — made a practice of anonymously handing out small amounts of cash, typically in the form of hundred-dollar bills, to needy people. Larry was a traveling salesman in 1970, and he wasn’t very good because by 1971 he was broke and sleeping in his car. After a few days of not eating, in desperation he decided to ‘rob’ a diner by ordering a big breakfast he couldn’t pay for, and then claiming he accidentally lost his wallet somehow. Ted Horn owner of the Dixie Diner realized the true nature of the situation, and instead of getting mad, or calling the cops, decided to give Larry a $20 bill he ‘found’ on the floor, which ‘might’ have fallen out of Larry’s ‘lost’ wallet. This lesson of kindness and generosity stayed with Larry Stewart. Ashamed of his initial act of deception, and humbled by the kindness of the diner owner, he vowed to himself that he would ‘pay it forward’ as soon as he was able. Stewart went on to become a multimillionaire, earning his fortune from cable television and long distance calling. Each Christmas from 1979 until his death in 2007 he continued giving cash away to the needy as Secret Santa. He quickly progressed from giving out $20s to handing out $100s, not just in Kansas City but traveling to other areas in times of tragedy, like NYC after 9/11/01 and Mississippi in 2005 after Hurricane Katrina. Sadly, he developed cancer, but because he was concerned about the poor and needy, he trained an army of Secret Santas and assistant ‘elves’ who would pass out $100s to the needy after he was gone. By the time he passed away on January 12th 2007, Larry Stewart had given away over a million dollars, all inspired by the kindness of ONE man who gave him a $20 bill decades earlier. Today, the army of Secret Santas continue to hand $100 bills to poor, their efforts supported by other wealthy philanthropists, and inspiring others to do likewise. So as we open our gifts on Christmas morning, and give presents to our friends and family, let us all be inspired by all the beauty and wonder of all the aspects and icons of the season. Let us not focus on ourselves, but think of our fellow man, and be grateful for all that we have. May we all find the courage to better ourselves, so that we can extend a hand-up to the fallen, and together we can with a smile, encouragement, charity and kindness, make this a better world. As always I wish you happiness and success! Merry Christmas and God bless us, everyone. Wrap it in a ribbon and a bow! Budgeting 103: Decorate for Christmas without breaking the bank! Every Christmas, there’s at least ONE house in every neighborhood decked out with so many lights and lawn ornaments that it could probably be seen from space on a clear night. Forget the initial expense of buying all those lights and glowing plastic luminaries, imagine the electricity usage! The numbers on the electric meter are changing so fast they’re probably an unreadable blur. And if the house is that decorated on the outside, you know the interior is just as festive. Imagine also the amount of time to decorate, then after the season, to un-decorate. Let’s not forget storing it all. If you can’t fit it all in your home, you need to rent a storage locker for a year. That adds up to thousands of dollars a year to transform your residence into a festive Christmas spot for about 4-6 weeks depending on how early you start, and when you take it all down. Now, there’s nothing wrong with spending that kind of money IF you are doing it to make YOURSELF happy, and you can afford it. If you’re just doing it to impress people you don’t know, or you’re trying to outdo the Jones’s on the corner with their ‘impressive’ display, you really need to examine your heart. Christmas is a great time of happiness and fellowship for the majority (despite some of the Christmas headaches) and should you care more about your friends and family than how your home looks. So here’s a few things to help save you money (and sanity) decorating for Christmas. Limit the number of lawn and outdoor pieces. Less is more. People will see a light up nativity scene or plastic Santa a lot easier it it’s not hidden among a 100 other luminaries on your lawn. Instead of stringing lights all over your house, save time and money by projecting the lights with a laser light projector. Decorate a room, or two at most. You don’t need to deck EVERY hall. DIY – Don’t buy expensive Christmas decorations. A few craft supplies can be used to make homemade ornaments, spruce up pine cones with paint and glitter, or whatever your mind can imagine. Be creative, but remember crafting takes time and skill. You can only do what you can do. I wowed a couple of my guests this year with simple holly rings ( which I made myself with craft supplies ) added to the bases of cheap votive candles. Don’t buy ‘collectible’ ornaments! Every year Hallmark and several other chains release HUNDREDS of expensive ornaments for every fandom base there is. They are cheap plastic trinkets that will never go up in value, and cost big bucks. No one cries when they accidentally break a simple glass ball. But Barbie’s limited edition Pink Corvette from 1997 or the Millennium Falcon? These will bring a fanboy or fangirl to tears when they break. Pine cones are FREE, go for a walk in the woods and gather a couple dozen. Just be sure to clean and disinfect them if you find them in the wild, you don’t want bugs invading your home. Use pine cones, a glass bowl, real greens and candles to make your own center piece. Take advantage of after Christmas Holiday clearance sales and stock up for next year now. I’m always able to get a collection of spare Santa hats for my guests for pennies on the dollar every year after the stores mark them down. I’ve gotten a dozen glass balls for 75¢ ! Wrapping paper is never so cheap as it is after Christmas. Just make sure to store everything you pre-buy for next year properly. I use Red Plastic Totes, and Ziploc bags, then put these all in the walk-in closet where I can find them. I have a special ornament tote, and wrapping paper tote to keep these safe as well. The money and time you save will make you jolly each Christmas, and allow you quality time with friends and family. As always I wish you happiness and success! And God bless us, everyone. Author instantcoffeewisdomPosted on December 17, 2017 December 17, 2017 Tags Budget, Christmas, crafts, debt, finance, friends, happiness, money, self improvement, success1 Comment on Wrap it in a ribbon and a bow! Ringle, ringle, coins when they jingle, make such a lovely sound. I am very fortunate to live in the USA, it’s the Land of Liberty and the American Dream, and home to more millionaires than any other country on Earth. There are many people today who seem to have a misconception that wealthy people are greedy and have somehow been responsible for the plight of the poor. Maybe it started with the depiction of the miser Ebenezer Scrooge in Charles Dickens’s A Christmas Carol. Let’s not forget that by the end of the story, Scrooge learns the true meaning of Christmas and becomes a wealthy benefactor to Tiny Tim and the Cratchet family, as well as reconnecting with his nephew Fred. The true meaning of Christmas is the birth of Christ, and the Greatest gift was Jesus’s sacrifice on the cross for the sins of all mankind. There are many who try to diminish or remove references to Jesus Christ at Christmastime, and that’s unfortunate. Christians are the most generous people of any religious group according to phlianthropy.com , and philanthropyroundtable.org supports the fact that the wealthiest Americans are the most giving. I did not grow up wealthy, but I worked very hard to get where I am today. I am grateful to God for all that I have, and I give a sizable amount to charity at Christmas. There are many charitable organizations that support many great causes, and there is a lot of duplication of services. It’s very important when donating to charities to know that the majority of the donated funds are actually reaching those in need, and not being wasted on overhead, or to buy a new Mercedes for the director of the so-called charity. I recommend using charitynavigator.org Charity Navigator is an American independent charity watchdog organization that evaluates charitable organizations in the USA, and will help you evaluate worthy charities so that you can avoid the less reputable ones. Christians have an obligation to help the needy. We received a great Gift to cover a Debt we can never repay. The concept of tithing is mentioned in the Bible, as is the story of the good Samaritan. As Christians we are created for doing good works to further the glory of God. Faith without works is a dead faith because the lack of works reveals an unchanged life or a spiritually dead heart. There’s rarely a day that goes by that I don’t find a penny on the ground as I walk the streets doing my rounds. On average, I actually find about $2 in coins and bills per week. That’s a drop in the bucket compared to my annual salary. Every little bit helps, and that’s the basis of crowdfunding. If everyone gives something, even pennies dropped into a Salvation Army Kettle, it adds up. The current population of the United States of America is 325,467,306 as of Friday, December 8, 2017. If every person in the USA gave just ONE PENNY to charity each day, it would add up to 3.25 million dollars daily. So don’t feel that a tiny donation is meaningless. Little things mean a lot, and great things come from tiny beginnings. As always I wish you happiness and success! And God Bless us everyone.